La La Land was the runaway winner of this year's Golden Globes. Damien Chazelle's muscial romance (which is released in the UK later this week) took seven awards including best director and Best Motion Picture - Musical or Comedy. Meanwhile, La La Land's two leads - Emma Stone and Ryan Gosling - won awards for Best Actress / Actor in a Motion Picture - Musical or Comedy. Drama, Moonlight, beat strong competition from the likes of Manchester By The Sea and Hacksaw Ridge to win the award for Best Motion Picture - Drama. In what was an extremely competitive category, Isabelle Huppert won the award for Best Performance by an Actress in a Motion Picture - Drama for her performance in Elle (which also won the award for best foreign film). Casey Affleck won the Best Performance by an Actor in a Motion Picture - Drama award for his superb performance in Manchester By The Sea. This year's recipient of the Cecil B. DeMille Award was Meryl Streep. Despite losing her voice, the actress gave a powerful speech in support of multiculturalism and journalism. While she did not mention him by name, Streep also criticised Donald Trump - warning that disrespect invites disrespect, violence invites violence. I can't wait to watch Moonlight when it is released in the UK in February. I have heard such good things about this film. It will certainly take a special film to beat my experience of watching Manchester By The Sea. On the face of it, this was a tough category. However, there was only ever going to be one winner... and deservedly so. It was great to see Damien Chazelle win this award. However, I would have been equally pleased to see the Golden Globe go to Kenneth Lonergan or Taylor Sheridan. I thought that Natalie Portman might get this award for Jackie. However, I am also so pleased that Isabelle Huppert got the recognition that she so rightly deserves. Her work is always superb and I would have also nominated her for her role in Things To Come. Lovely to see Emma Stone win this award. Again no real surprise, but an impressive category nonetheless. I haven't seen Fences (it is not out in the UK until February). However, I love Viola Davies and am so glad to see her work being recognised. In addition, any performance that can beat that given by Michelle Williams in Manchester By The Sea is remarkable indeed. Another impressive category, but no real surprise about the winner. Casey Affleck's performance in Manchester By The Sea is stunning. I did wonder if Hugh Grant might just sneak this award for his wonderful performance in Florence Foster Jenkins. However, it was great to see Ryan Gosling win the Golden Globe. It was definitely La La Land's night. Aaron Taylor-Johnson is brilliant in Nocturnal Animals. He is almost unrecognisable in this role. However, I felt that Micheal Shannon's performance was more powerful in this film and was surprised that he wasn't nominated. Out of the nominees in this category, I wanted Jeff Bridges to win for his truly wonderful performance in Hell Or High Water. I was hoping that this award would go to another film - if only to spread the love and recognition around. Perhaps to Manchester By The Sea or Hell Or High Water? I am very much looking forward to watching Elle when it is released in the UK in March. I did wonder if Toni Erdmann might get the Golden Globe - there has been such buzz about this movie. Sadly, the only film that I have seen in this category is Divines - I would highly recommend this movie (you can watch it on Netflix). While I expected Zootopia to win the award (and I did love this film), my favourite animation of 2016 was Kubo and The Two Strings. I thought that Johann Johannsson's score for Arrival was stunning. However, I have had the La La Land soundtrack on hard rotation for weeks, so I can't say that I am surprised at the winner in this category. Again, I love the La La Land soundtrack. However, I would have also been pleased to see Moana's key song, How Far I'll Go, get the award. The Golden Globes - Did They Get It Right? 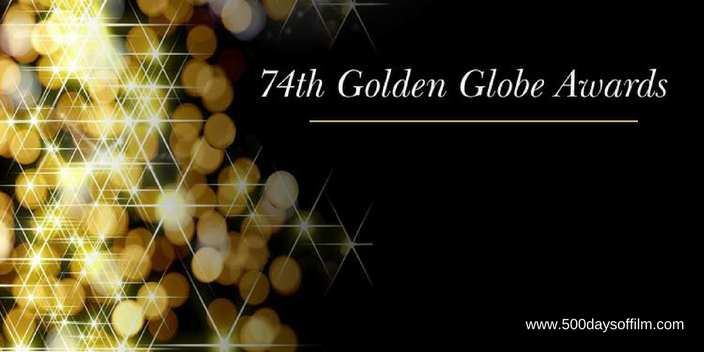 What do you think of the 2017 Golden Globe Awards? Do you agree with the winners? Anyone been robbed in your opinion?! Let me know - either way - in the comments section below!